Providing fishing boat charters and fishing trips on Lake Dillon for fisherman of all skill levels, at family friendly prices. Had a great time with my family. Was very professional and patient even with younger fishers. Highly recommended if you look to fish in Frisco. Awesome time. Randy really knows what he's doing and where to find the best fishing spots. If your looking for a good time in the Frisco area you should definitely try this. My family had a great time with Randy and Sherry. We learned a lot and caught 3 salmon and a nice rainbow trout. My two teenage boys really enjoyed themselves. Thank you guys! My family and I had an amazing time with Randy he was very helpful, lots of knowledge about fishing and great with all my boys. He spent extra time with my youngest and made sure he caught a fish, knew how to bait the hook and pop the line to attract the fish. I would recommend Randy highly!!! Reserve Your Warm Hut Today! Experience our and our customer's adventures on Dillon Lake, and the surrounding areas. We are so grateful for all the amazing people we have had the privilege of serving over these many years. Thank You! Click on the icon to read our FAQ page or send us an email by clicking the Contact Us button below. 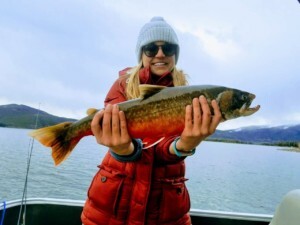 Alpine Fishing Adventures is rated the best guide service on Lake Dillon and offers fully guided ICE FISHING TRIPS, PONTOON FISHING CHARTERS, and FLY FISHING TRIPS on scenic Dillon Reservoir near Breckenridge, Keystone, Frisco, Silverthorne, and Vail, Colorado. While on a fishing trip at Dillon Reservoir you can relax and take in some of the best mountain views around. 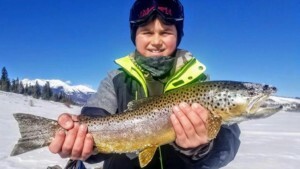 Our ice fishing trips and pontoon boat charters can accommodate families with young children, parties and groups, and those with special needs. KIDS 10 AND UNDER FISH FREE! 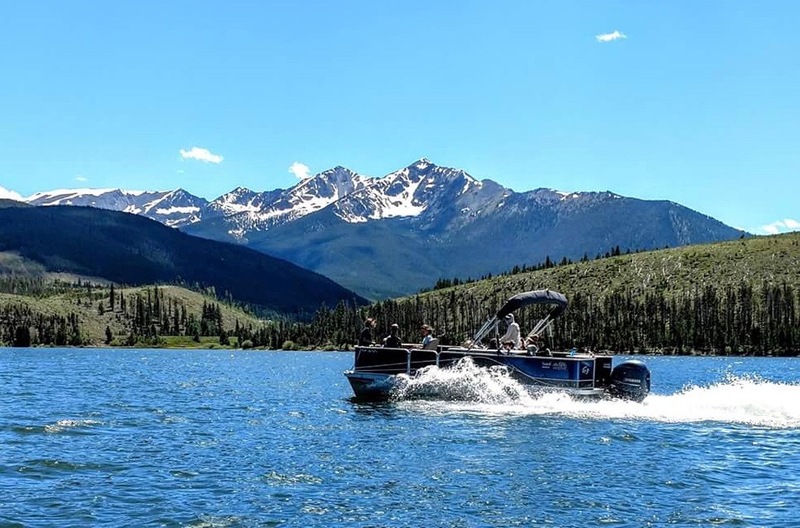 We offer the best price/value on Lake Dillon with our 3 hour or 4 hour trips! We also provide fishing charters and fishing trips for the serious and accomplished fisherman with our 6 hour “Black Diamond” trip options. Read the Summit Daily News Article about predictions that big fish are getting bigger. Our waters are loaded with Kokanee Salmon, Arctic Char, Brown Trout, and Rainbow Trout. You can try your luck with Salmon or Rainbows to take home for dinner, or catch and release our unique Arctic Char and trophy Brown Trout. Dr. Lindsay Regali from Virginia caught this state record arctic char on 11/6/17! 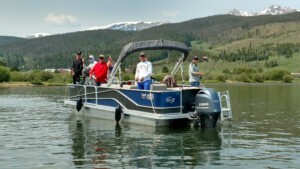 Come enjoy a relaxing day of guided fishing on Dillon Reservoir and the surrounding scenic wonderland of Breckenridge, Keystone, Frisco, and Vail, Colorado. 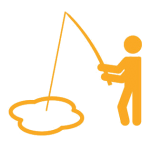 For information on purchasing fishing licenses, please click HERE. 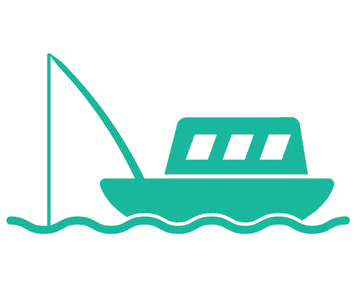 Our pontoon fishing boats are spacious and comfortable. We will take you to the hottest fishing spots to explore Lake Dillon. You will take in some of the most beautiful views Colorado has to offer. 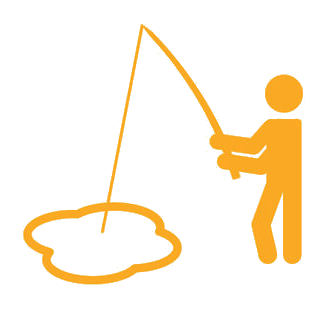 We provide all equipment and tackle needed. Colorado Fly Fishing on Lake Dillon at it's Finest! 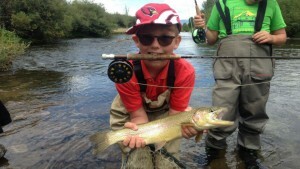 We offer walk wade fly fishing trips at the Snake River, Ten Mile Creek, and Blue River inlets. 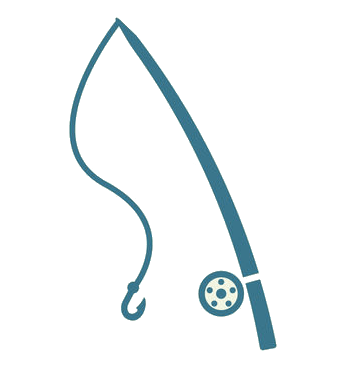 We provide instruction on use of fly fishing equipment, casting technique, and fly selection followed by 2 hours of on-the-water guided fishing. Stay Warm while Ice Fishing with Us! We offer fully guided Ice fishing trips on Lake Dillon from just before Thanksgiving until the middle of April depending on lake ice conditions. 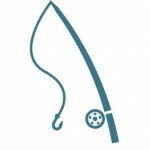 We provide rods, reels, all tackle and state-of-the-art fish finders. PURE FAMILY FUN AND THRILLS! 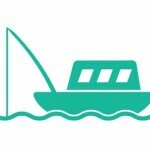 TRIPADVISOR – WRITE US A REVIEW?